Allow me to bang out a couple posts to finish with my Recreate updates. Thursday was by far the most amazing day on a personal level at Recreate. Nathan had a great recap where he referred to it as the best morning in Recreate history. It began with a visit from Mark Stuart, lead singer from Audio Adrenaline. Wow. It was incredible hearing him share so authentically from the struggles of his life. His vocal chords giving out. The end of AA. His marriage falling apart. Hearing how God spoke to him and carried him through it all was inspirational. And I said it once, but it’s worth repeating, I’ve never heard someone share so openly and honestly and it made all the difference in the world. Mark also shared about the ministry he is currently heading up, the Hands and Feet project. It is a ministry to orphans in Haiti. Please go by their site and find out what you can do to get involved. Seeing his video and hearing about it gave Rachel and I a hunger to go over there and help out. Who knows, maybe one of these days we’ll make it happen. I loved the answer Mark gave when asked if they facilitate overseas adoptions for the kids into families over here. He responded that while they would not get in the way of that, it is not their mission or goal by any means. Rather, they want to raise up a generation of devoted Christ followers who can significantly impact their nation of Haiti. Pretty cool I thought. Then we entered into a rich time of worship and communion. 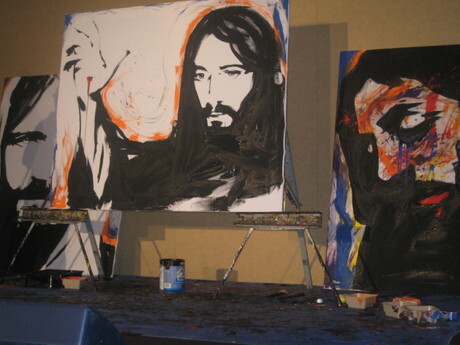 During that time, Mike Lewis, the Jesus Painter did three paintings. Look him up on YouTube and you can see some incredible work from his One Way project. Music was played and worship led by Mark Roach and Mark Lee, songwriter and member of Third Day. If you haven’t watched the video of this time in my earlier post, go check it out. To finish off our morning, we listened to Ken Davis share with us. WOW. By the time he was done, there seriously was not a dry eye in the room. He was absolutely hilarious as he shared stories from his own life. yet the truths he shared were profound and went deep. He encouraged us mainly to not miss some windows of opportunity to love our families and to be satisfied in Christ where He has placed us right now. Wish I could share some notes or more detail with you, but I couldn’t do it justice. So that was an incredible morning. The afternoon was the most peaceful/inspiring/challenging of the week for me. But I’ll share that in another post or two. It’s deserving of it’s own.